Flannel Friday: I Ganked This From Mister Rogers! I mean, 9 months, and I haven’t even finished these 300 episodes…and it’s not for want of effort or interest. Every single episode of MRN is FULL of CONTENT. What’s more, I have began to explore the MOUNTAIN of archival, documentary, expository, and professional development materials available through PBS, Fred Rogers Foundation, the Fred Rogers Company, and the (independent) and astoundingly thorough Neighborhood Archive. And let’s not forget the books, there are many, many, many books by and about Fred Rogers, Family Communications, friends, fans, etc. Suffice it to say, I have been taken over by the learning monster. So much so, in fact, that I haven’t even been able to really think about where or how to start. So I am just going to start with the smallest little bit. But believe me, this is just the beginning! In fact, I am cooking up a way to not only share what I know, but I would love partners. I’ve had a few librarian friends contact me with Mr. R questions of various sizes: big, small, general, specific, etc. I think in all cases, I have overdone it. But I CAN’T HELP MYSELF!!! This post is getting away from me, so I will get to the purpose of this post: Flannel Friday. 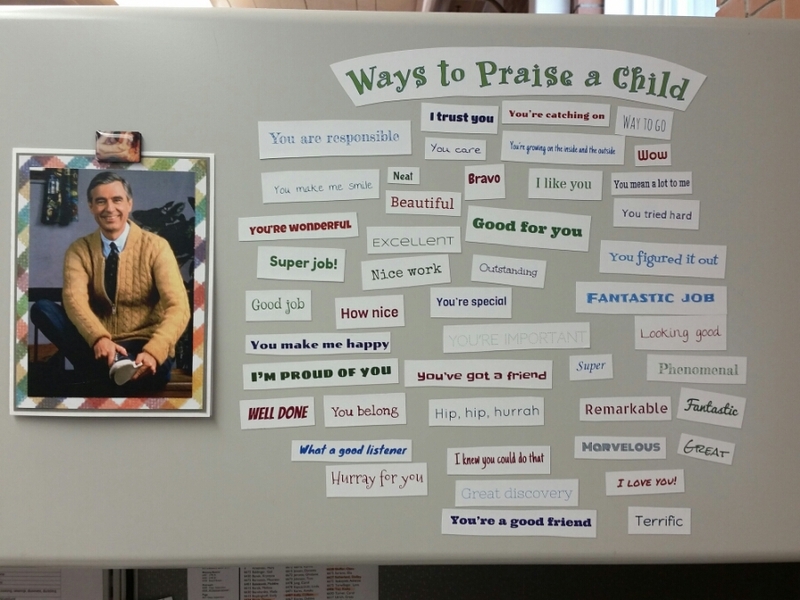 Ways to Praise a Child is a magnet board I made for my Toddler Timers, but it would be great for virtually any age. In fact, it would a great tool for a parent workshop! I was reading through old issues Around the Neighborhood on the Neighborhood Archive (This is a newsletter that Mr R’s production company, Family Communications published for parents and childcare workers when the show was in production…Unfortunately, I CAN’T REMEMBER WHICH ISSUE AT THIS POINT AND THERE ARE A LOT TO SCHLEP THROUGH, BUT GIVE ME TIME AND I WILL FIND IT). Anyway, I was reading through these old newsletters when I spotted a little blurb in the sidebar entitled, “Ways to Praise a Child”. 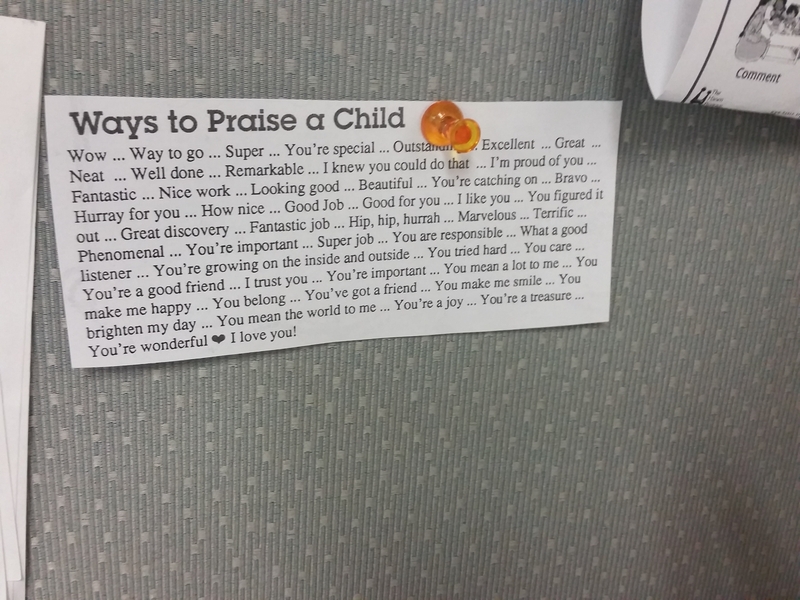 I clipped it to hang above my desk. When I used it in storytime, I just asked parents, “Do you ever run out of ways to praise your children? I mean, they learn so much, so quickly, it can be hard to think of what to say without sounding like a broken record!” Everyone loved this, parents, AND ESPECIALLY THE KIDS! In fact, they loved it so much, we didn’t have a chance to read any books. The kids loved hearing the praise out of context. And during playtime, they weren’t only repeating the various phrases, they were demonstrating the behavior that triggered the praise! How cool is that? It just goes to show, WE NEED TO STUDY MISTER ROGERS NEIGHBORHOOD! Kids, parents, teachers, and especially librarians must dig into this material! It will change your work and your life. I can share the doc, if anyone would like to use it. Happy Friday! Megan is our lovely host this week…Thanks Megan! Categories: Mister Rogers Neighborhood | Tags: Family Communications, flannel friday, Fred Rogers, Mister Rogers Neighborhood | Permalink. When I read the Knight Foundation’s special invitation to libraries for submissions to the Knight News Challenge, I didn’t run to put a submission together myself. Instead, I made a vow to keep an eye on the submissions. You see, I’m a librarian on the front lines of library service. I don’t always have a say in what equipment gets purchased or what programs get implemented in my library. I can make suggestions and write proposals, of course, but ultimately, the final word comes from the administration and board of directors at my library. And you know what? I’m cool with that. The fact is, there is a spectacular amount of freedom and creativity on the implementation-side of librarian work. So when the proposal started pouring in, (Whoa! There are 680 library submissions! YAY LIBRARIES!) I decided that, rather than submit my own proposal, I’d try a thought experiment: What would I do with my favorite Knight News Challenge Project? The first step was to read through as many submissions as I could in a reasonable amount of time. I chose a few of my favorite project ideas, and started brainstorming. Then I had to pick my pony, and run with it. In the end, there was one submission that got my library mojo going. It was this entry submitted by Phil Shapiro’s entry: Video Booths at Libraries to Create Charlie Rose Style Interviews to Capture the Best Ideas From People Who Are Not Famous. Video booths are a fantastic idea for public libraries, and I think there many ways we can put them to use. Building one from scratch is feasible, but a huge endeavor for a small library. Being a children’s librarian, I’m usually thinking in the youth services context, but I think it’s a flexible concept that could be riffed on for a wide variety of purposes and audiences. The main objective is largely influenced by my two major professional and personal heroes: Fred Rogers and Vivian Paley. This summer, I dove into two interrelated research projects. I find that their ideas have shifted the foundation of my day-to-day world, and allowed me to deepen my connections to the community in which I work. Moreover, my research lead me to develop two experimental library programs based on the work of these early child development visionaries. I wrote about Little Authors in an earlier post. It’s a story dictation program for kids 3-8. Kids tell stories to an attentive adult who writes down their story verbatim. I think a video booth would allow this program to grow in unimaginable ways. One of my “crazy, over-the-top goals” would be to develop a community-based web series like Written By A Kid. If you haven’t had a chance to watch it, I recommend watching Scary Smash ASAP. Over the summer, I started a comprehensive research project based on the work of Mr. Rogers’ Neighborhood, and frankly, it has transformed my life inside and outside the library. No where is this more true than in the storytime room, and my reference interactions with parents. 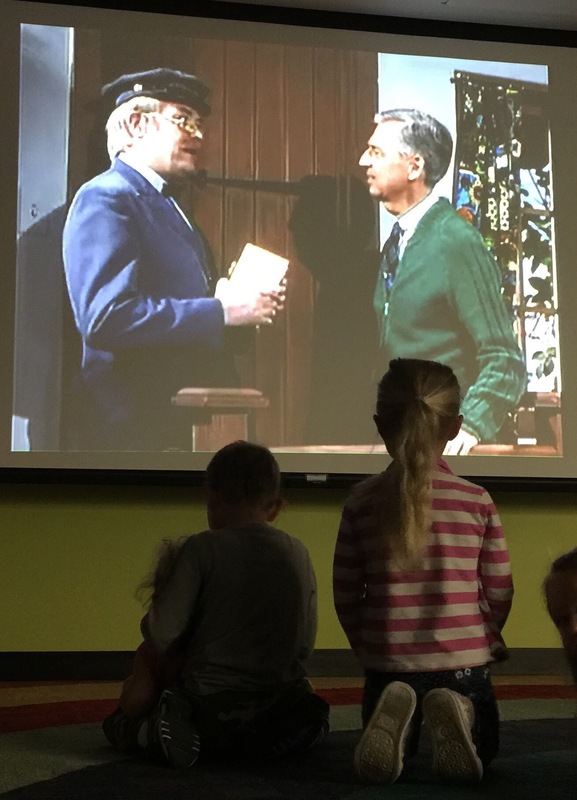 Fred Rogers’ core philosophy was “Deep and simple is far more essential than shallow and complex.” In fact, this is why the video booth concept is so perfect for public libraries. There are countless simple ways to use video booths to give community members a voice, and bring people together through the sharing of ideas, experiences, beliefs, questions, etc. The simplest way is simply to pose simple, specific, yet open-ended, questions-of-the-week to parents who frequent the library, and request informal, off-the-cuff answers in 30s or less. Here are just a few examples of good questions to “ask your neighborhood”. What was your favorite toy/book/story as a child? What is your earliest autumn/summer/winter/spring memory? Did you ever help your sister/mom/dad/teacher do something that made you feel especially proud? What questions does your child ask you the most? What is your child most curious about? What is the single most important piece of advice you can offer a 1st-time parent? What is single most important piece of advice you can offer a parent who is about to have kid #2? What are your best parenting lifehacks! What is the weirdest question your child has ever asked? What is the most interesting/funniest thing you’ve ever done or seen at work? I have one BIG DREAM public service project that might be ideal for a video booth. Actually, it doesn’t require video so much audio, but I assume the video booth could be developed with audio-only recording in mind, as well. Like I said, this is a highly speculative project since the technology is still in the development stage. But, after all, so is this Knight Foundation grant proposal. I figured, why not blend these two speculative ideas together? You can learn more about this incredible technology on the VocalID website. I learned about Rupal Patel’s TedTalk from February 2014. It’s an inspiring call to action for the Human Voice Bank Initiative and VocaliD. Next, I thought of Sharon Draper’s 2012 bestseller Out of My Mind. I concluded that these two brilliant minds offer an opportunity for a World Voice Day Symposium. Here are links to her Ted Talk and her post on the TedBlog: Everything You Need to Know About Donating Your Voice. I think VocaliD and public libraries make an ideal collaborative match. What is more, a video booth would provide the perfect tool to support voice donation opportunities to patrons. Draper’s novel, Out of My Mind is about Melody, an 11-year-old girl with cerebral palsy who obtains a computerized speech device for the first time, and how she navigates the experiences she faces as she adjusts to her new abilities. While Draper doesn’t overtly assign racial identities to any characters in the story, I think Melody’s story is about the intersection of race and disability. I believe this book provides a unique opportunity for a nuanced conversation about the particular struggles an African American family faces when dealing with healthcare providers and educators. PROGRAM: World Speech Day Celebration/Symposium (April 16) with speakers Rupal Patel and Sharon Draper. AGE GROUP: All Ages, with break out sessions for kids and adults. GOALS: Technology: Host a VocaliD Voice Drive, and offer ongoing voice donation services through the DML. Voice donation requires the donor to read or repeat 3200 sentences into a recording device. The entire process takes 2-3 hours from start to finish, and it can be broken down into 15-minute segments.Civic Engagement: Voice donation offers patrons the opportunity to make a real difference in the lives of people with severe speech disabilities, in exchange for a few hours of their time in the DML. Public libraries can add voice donation an optional activity for the summer reading program. One Last Thing…er, um, correction…Two or Three Last Things. 1) Knight News Challenge people: You are awesome! Thank you for this challenge! 2) Good luck to all the librarians and library supporters who are putting the final touches on your submissions! 3) There are many inspiring submissions entered in this challenge! Join me, and try doing a thought experiment if you are so inclined! Oh! And PLEASE GO LOOK AT THE PHIL’S VIDEO BOOTH ENTRY BECAUSE IT IS AWESOME!!! 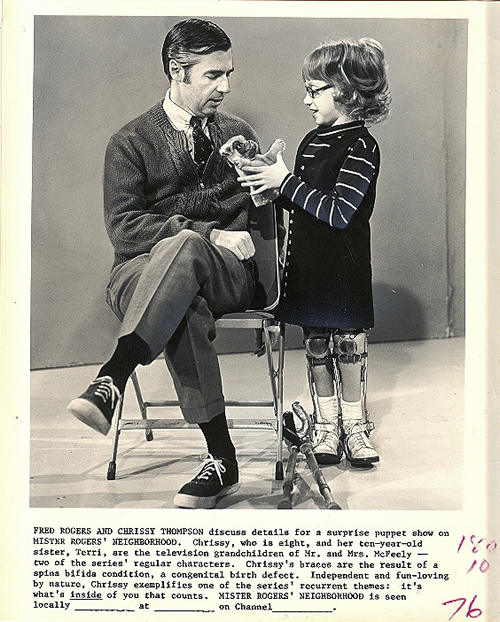 Categories: Mister Rogers Neighborhood | Tags: brainstorming, Colleagues, crowdsourcing, Knight News Challenge, librarianship, Library Innovation | Permalink.